Welcome to Ixchel II Beach Condominiums located on the island's most beautiful beach, Playa Norte (The North Beach). 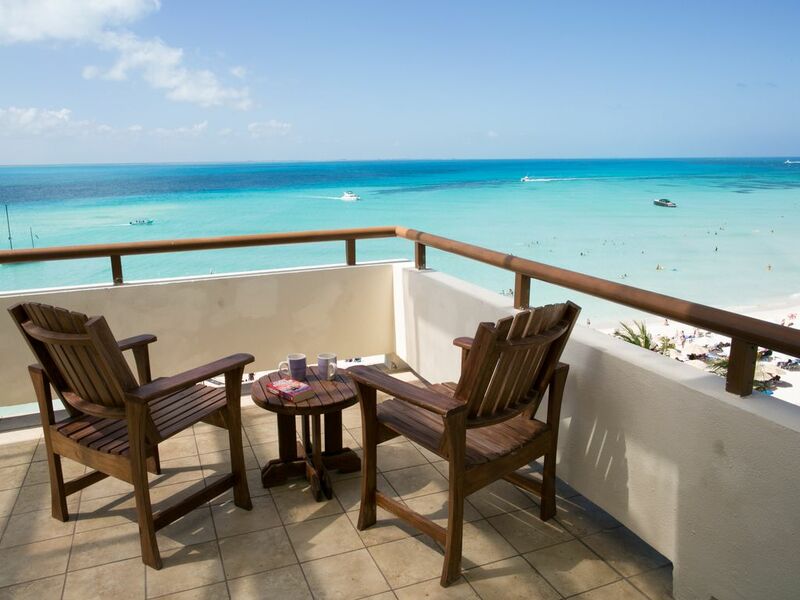 We are proud to offer you the best view at Ixchel II!! It is fully furnished on the 6th floor and over looks the Caribbean. This luxury 2 bedroom condominium suite includes a fully equipped kitchen with stainless steel appliances and dishwasher. Our dining room, and living room has a leather couch & loveseat, 42' plasma flat screen TV w/Direct TV (NFL Package included) & DVD player, IPOD docking stations. The kitchen contains stainless steel refrigerator/freezer, stove, dishwaher, microwave, blender, toaster, pots and pans, plastic wine glasses, assorted utensils, knife set and bottled drinking water. The master bedroom is beautifully decorated. It has a king size bed, with a beautiful fully tiled bathroom with granite countertops. Also, in this master bedroom it has a large balcony with 1 sun lounger, 2 sets of patio furniture, our newest addition is a Grilling station and mini frig to chill your favorite beverages on the balcony. This bedroom has a luxury mattress! This large balcony runs along the front and sides of master suite and living room area-which has amazing views of North Beach and offers incredible sunsets!! Rates for this 2 bedroom Ocean Front suite start at $350.00 - $750.00 per night. Please, scroll down below to see more rates based off the time of year schedule. If you're looking for a great place to stay and your on a budget our unique second bedroom is just the place for you!! It has one king size bed which give you lots of extra room instead of other places at Ixchel II that have the two queens in their second bedroom. Our second bedroom includes a fully tiled bathroom and a table for two with a view of the ocean or an area for reading. All bedrooms come with cable TV, DVD player, IPOD docking station, separate individual air conditioning units with controls for each room, radio alarms, electronic safe deposit boxes, iron and ironing boards, hair dryers in each unit and bathroom amenities. All rentals include daily Housekeeping and taxes. We are also, happy to assist with renting out other units if large parties are going to be staying at Ixchel II. Also, we can arrange a coordinator to organize anniversary, renewing of the vows or wedding parties on the island. We know of a great resource if needed and they live on the island. Checkout more photos of our units at more links information after our calendar here on the VRBO website. The island of Isla Mujeres is only 5 miles long and 1/2 mile wide and it is easy to get around, offering a variety of delights to all visitors. The best beaches are on the north (Ixchel II) and west sides of the island, where the water is shallow, and calm and the white coral sand feels cool on the feet. The North Beach is the island's most famous and popular, with restaurants and bars where you can enjoy everything from a tall drink to the freshest of seafood. Lounges are available for sunbathing and water sports equipment such as kayaks, water bicycles and sailboards, can be rented. Most of the non-beach activity on the island is centered on Hidalgo, the main street of the island which is just walking distance from our amazing place at Ixchel II. It is full of shops featuring typical Mexican Handcrafts and restaurants serving a variety of cuisines, including Cuban, Thai, Italia, fresh seafood and of course, traditional Mayan and Yucatecan dishes. Open-air bars offer the opportunity to enjoy your favorite beverage in a relaxing atmosphere. On the east coast of Isla Mujeres you will find rocky shores great for tide pooling, shell hunting and watching the waves of the open Caribbean Sea. Just take a look at the pictures-They speak for themselves! Whether you're a traveler seeking relaxation, romance or exciting family fun ISLA is for you. VOIP (voice over internet phone) in living room which includes FREE calls to the US and Canada in master bedroom suite only (Unit 610). Central Air and Dehumidifiers in each room. Beach towels are available at front desk. Daily housekeeping included. Includes: coffee maker, toaster, blender, knife set, assortment of utensils, pots and pans, dining utensils & dinning ware and glass ware. Bring your DVD's; one player in each room. Living room has a 42' plasma screen and IPOD docking stations in living room and standard room. With 2 sets of patio furniture and 3 sun loungers for laying out. Hammock for reading or relaxation. This large Balcony runs the length of the living room. Common Snack bar open for breakfast and lunch by the pool. Bar with international premium brands and drinks of your choice. Open 9-5 pm. BOSE IPOD docking stations in each room and a recent addition of a wine fridge in our kitchen. Deep sea fishing, dolphin discovery (Garafon), golf cart and scooter rentals and walking distance to downtown which includes a grocery store, shopping and restaurants.